Life hides from malignant stars and irradiated wastes, deep in the dark. While cosmic evils haunt the surface and the endless deeps, life clings to existence where-ever it can take hold. Welcome to Araea; a weird-fantasy world set mostly deep underground. Path to Araea 1.0: Stuff Left To Do! Rapidly growing masses of mold, no longer content to simply wait for something dead to grow on. This is where we'll make our name. This is the gateway to the unknown. Standing at the precipice of the unknown, the Far End is a frontier town at the far end of the Sprawl. It is the last stop before caverns never before seen by human eyes and a beacon for explorers and fortune-seekers. Shanties and ramshackle houses stand next to one another. It is a mess of a town, running on ambition and adrenaline more than anything else. Located in a gorge just past the last stretch of road from the Sprawl, the Far End has grown to occupy the snaking branches near the central cavern. The wealthy claim entire branches for their own estates and ranches, while others are filled with the poor and hopeful of the Far End, scraping by in tents and coffin-sized homes. The ceiling of the main cavern is high enough that there are several stories of buildings carved into the rock. The gorge the town lies in was originally picked for the stream of water that ran through the center and did much to supply the first settlers with water. As the city grew, the stream diminished. Now, all that remain of the once pristine brook is a polluted pond, filled with garbage and only drunk by the most desperate. At least three paths lead back into the Sprawl with one major road, but only one path leads into the unknown at the other end of the town. It is close enough to the Sprawl that the climate is relatively temperate, heated only by more and more bodies cramming into the smaller space. It smells of Khtam, sweat, alcohol and industry. Every now and then, a great, slow gust will emerge from the tunnels leading to the unknown and wash over the town with a damp, rot-tinged stench. The citizens of the Far End take a perverse pride in their precarious situation, far from all other city-states and civilization. They are the door to caverns never before explored and the city sees no end of rookie Kaia seeking to prove themselves, prospectors looking to strike it big and all manners of neer-do-wells. Expeditions into the unknown are almost daily and not all make it back. But that doesn't deter the next group to set out, everyone believing that they will be the ones to strike it big. Ambition, industry and an edge of ruthlessness are the hallmarks of those who make their home in the Far End. It is a mix of poor workers, wealthy patrons, brave explorers and sleazy hucksters. Everyone has a plan and a game, and everyone is either a rival or a partner. It is a rough and tumble down, with elements from cultures of nearly every city-state close enough to see migrants travel to the Far End. In general, people try to get along the best they can, but tempers flare and ambitions clash. It is a town of a thousand petty feuds and rivalries, between people and groups both. Brawls are regular occurrences, over any number of slights, but don't usually end in death or murder. In the end, there is only one thing that everyone in the Far End truly agrees on: business first. "Rule" is a bit strong of a word. The Far End doesn't exactly have a centralized government. While it does have a mayor, currently held by a man of bland and agreeable personality called Geran Ther, his role is largely that of a figurehead. In reality, the city is ruled by a committee of the most powerful factions within it and just as often they will simply do as they please within their own fiefs. The town is still young and those with power are largely making it up as they go along, with no better temperament than the citizens of the city. There isn't much in way of public service in the city, with the exception of the water distribution that makes sure everyone has something to drink. Beyond the major powers, the town has a number of minor gangs of criminals tending black markets or outlaws hiding from patrols in the Sprawl. Law and order is far from uniform, with each faction policing their own turf and leaving the areas between them largely ungoverned. Only when crimes are too violent or heinous to ignore do the four groups actively intervene. The Asashi are an exception. They have no desire or intent to be rulers or to control land, or have any holdings to speak of. But with their numbers, there's very little they can do to stem the tide. 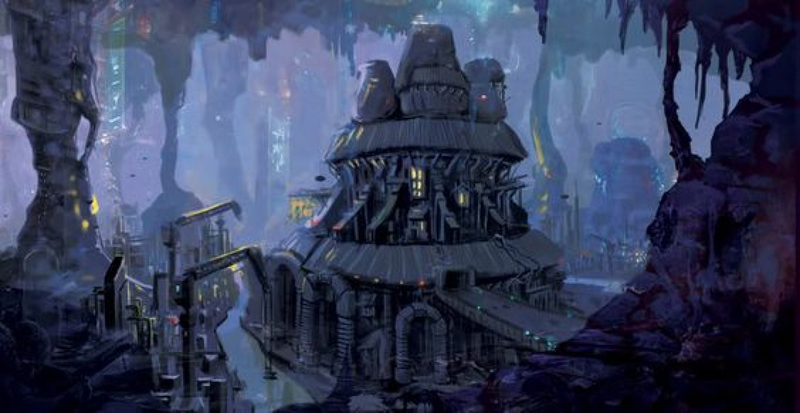 The Far Deep has a mix of mining, farming and ranching within the city. Small orchards and farms are testing the soil beyond the gate and bringing the produce back into the city, while prospectors range far into the unknown to return with precious metals and gemstone. The town and its industries are still growing and at the time, they're forced to import most of their tools and weapons. Much of the food and all of its water is imported, the later coming from the frozen lake in the Sprawl. In turn, they sell the fruits of their explorations. Metal ore, precious gems and rare material are their most regular and valuable exports. They've made enough well that they see a seasonal influx of labor, poor working men and women coming to the city with hopes of making enough to set them up elsewhere. The Far End is a mad scramble of coming and going, with only the four major powers remaining a true constant. House Lōbha The Lōbha are a line of noble-merchants from Mharaji whose fortune had largely deserted them. They've come to the Far End as a last, desperate gamble to restore their coffers and the prestige of their house name. While the Lōbha are poorer then they once were, they were still wealthy enough to claim an entire branch that juts out from the south of central gorge. They consider themselves a proud elite, forced to trod the ground of the Far End by catastrophic circumstance. Others consider them pompous bores. They have few true friends, but many who are loyal enough to their remaining coins. Asashi While they have neither the wealth nor the manpower that the other factions can boast, the Asashi Kaia team have something no other faction can claim: knowledge. They are by far the smallest, consisting of only five Kaia and a score more who see to their holdings, but no one else have gone as far into the darkness as they. Despite their talent, they are naive when it comes to the game of politics. Fortunately for them, they're popular with the common citizens and useful to everyone else. Mazaea Not a group but a single person, Mazaea is the sole owner and ruler of the largest farm and ranch of the Far End. A ruthless business man and a skilled politician, he has a stranglehold on the town's food stores and he knows it. A practical man, Mazaea makes friends with those he can. It is only those who truly earn his ire that see the extent he will go to protect his investments. Wochi The Wochi are a loose collection of miners, prospectors and workers, founded by the first settlers. They are more then a little bitter to have to share their stake with the others. They consider everyone else to be at best a parasite and at worst a thief. The others consider the Wochi to be a bunch of ornery, difficult bastards who say no just to say no. The Far End was founded just a scant few decades ago. Since then, it has faced trials and seen great fortunes found then squandered. The earliest settlers were prospectors who traveled along the Sprawl, looking to stake new claims. When they found the gorge here the city lies, they set camp to take advantage of the water and nearby fertile caverns. When they set out into the unknown, less than half of the original party returned. But they did so speaking of seams of gold and iron, ripe for the taking. The prospectors tried to keep their claim a secret first, but the expedition had diminished them to the point where they were unable to fully exploit their find. More than once, wild and vicious predators forced them to abandon their camp for the safety of the Sprawl. Once they begun to use what they had managed to extract to hire more workers and mercenaries to guard them, word inevitably begun to spread. Since then, it's seen relatively steady growth. People come and go to the Far End, seeking to strike it big and then settle elsewhere. Others have greater ambitions and dream of a new city-state, born from the unexplored wealth just beyond the town borders. Two decades into the town's founding and many of the branching caverns adjacent to the central gorge were still being explored and settled. The fighting for territory and land claims was vicious enough to stir a dormant hive of particularly aggressive Chiwara and ignited what became known as the infestation. Chiwara poured out of the tunnel and into the city, driving the inhabitants from entire sections. Only with the help of mercenary specialists would the Chiwara slowly and painfully be forced from the town and put to the sword. Even to this day, it isn't uncommon to find a small nest lurking in some dark, seldom visited corner of the Far End. Bug-hunters make a living by rooting out these hidden nests. Tenacious and aggressive, the Chiwara close to the Far End do not fear mankind. Some have even made their nests in the basements of buildings, exploiting any gap in the citizens vigil. It is still not known exactly when the plague began or who brought it to the town, but it is believed that some expedition returning from a deep journey into the hinterlands were the unwitting carriers. Whatever strange fungi that they had run into on their expedition soon started to spread among the citizens who were at this point mostly drawing water from the communal brook. The infection made fungi grow and bloom on their skin, with just shy of a quarter of the town succumbing to the disease. When no more hattick was left to fuel the funeral pyres, corpses were simply tossed down into the deepest cavern they could find. Today, the Far End is booming. More and more arrive each day to try their luck, either working in the town or in the surrounding caverns, or to take the plunge themselves and hope to find fortune in the darkness. City-states like Mharaji and Thawke are beginning to take note, and their interest spell trouble for the city. No matter the challenges standing in front of them, everyone who comes to the Far End are sure they will be the ones to strike it big. Once again a brilliant article! Your layout is lovely and it really adds to the experience. Your writing is describtive and inviting as always and you've covered everything I feel like I need to know. The mix of text, quotes and pictures (though still placeholders right now) is really good, it doesn't feel like I'm reading forever, even though there is a lot of text! "with no better temperament then the citizens of the city." I think it's supposed to say than instead of then, but that seems to be the only obvious mistake in this masterpiece of an article! Awww, thank you! :D I am glad you like it! I fixed that error! I'm glad you liked it and thanks for catching that; I screw up then/than with alarming regularity, haha! I liked this bit: "It is a mess of a town, running on ambition and adrenaline more than anything else." I think this is a perceptive sort of description, and after reading it, I feel more interested in your narrative voice. Nitpicky detail: "For every tunnel explored and mapped, another two remains shrouded in darkness and mystery." Did you mean remain? " "Rule" is a bit strong of a word. " I enjoyed the subtle humour of placing this quote right under the government heading. I did find this to be a little on the long side, and I'm wondering if some of the content here would be better separated into additional linked articles. Thanks for sharing this part of your world! Thanks! I'll do a general text tweak soon!